Preserve your cherished memories with our Premium Table Top Epoxy. This system is designed to be used on table and bar tops and counter tops. With a mix ratio of 1 to 1 this epoxy resin system is easy to use and dries clear providing you with a a surface that both protects and and displays your memories. This product is a 100% solid, two component, clear polymer coating that is mixed at a 1 to 1 ratio by volume. Each kit contains a bottle of resin and a bottle of hardener. The product cures to a clear, high build, glass-like finish that resists scratching, yellowing and will not distort with age. Items coated with it will become permanently preserved and protected for your enjoyment throughout a lifetime. This product will not exhibit blushing or sweat out under high humidity conditions. We have thoroughly tested this material with half of a part exposed to UV for over a year and you can't even tell which side was covered! 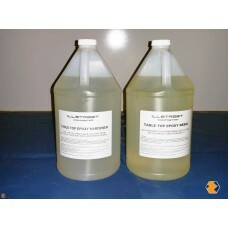 This product is commonly seen on bar tops and table tops in many bars and restaurants. The product should be applied in two stages. The first stage is referred to as the seal coat. The seal coat is brushed on in a thin layer and is used to seal any pores in the surface and prevent air bubbles from forming in the following flood coats. This stage is followed by the flood coat, which will flow and self level, clean brushes or squeeges can be used to help spread the epoxy. Flood coats are applied in 1/8" layers at a time, as many as desired can be applied, however one to three coats is average for most table or bar coatings. Recoating can usually be be done within 4 to 8 hours. If re-coated within this time period no sanding is necessary between layers. Objects, such as pictures, maps etc. can be imbedded in this product during the pours. Most photo quality paper does not require any special preparation however sometimes thin paper objects must first be sealed with a white glue or similar product to prevent the epoxy from fully penetrating the paper and causing it to become transparent. All porous materials should first have a seal coat of epoxy applied. This will prevent air bubbles from occurring in subsequent flood coats. Usually the objects can be set in place before sealing. For best results the product should be used at temperatures from 70-80 degrees F. The room which you are working should be clean, dry, dust and insect free. Settling dust can often cause blemishes on the glassy surface. Please not that although this product will resist yellowing better than other epoxies it is NOT 100% UV resistant. Continuous outdoor UV exposure over months or years will cause the finish to lose its gloss and cause gradual changes in color. Coverage: See the coverage calculators below to figure out how much table top epoxy you need for your bar top or project. Remember not to combine seal and flood coat coverage's. Seal coat coats are just thick enough to seal any bubbles or dust in place and only need to be .02" thick. Example: A 6ft x 4ft bare wood table (24sq ft) would require 2 Quarts to complete ONE seal coat and about a gallon and a half to complete ONE flood coat for a total of Two Gallons. Graduated Mixing Cups - An accurate measurement is extremely important to achieve optimum curing. Applicators - Rubber squeeges are simple to use and leave no air bubbles. Foam brushes and nylon bristle brushes are preferred with epoxy, make sure there are no loose hairs. Hair Drier, Heat Gun or Torch - These are used after the pour is completed and the epoxy is still liquid. A very smooth stroke across about 6-12 inches above the epoxy surface will burst remaining air bubbles.